OCR of 13-page PDF below. John J. Morris, Ellis Owens, Floyd Hausman, Norman E. Smith, John J. Griffith, Owen E. Owens, A. Dewey Benninger and Harry W. Muschlitz. Executive Committee: Roscoe Berlin, William Sauerwine, Lawrence Haines and William D. Reinsmith. History of Post Name: Named after Allen O. Delke, first local boy killed in action. He was a private in Co. "I" 314th Infantry, 79 Division, killed Nov. 2, 1918, Meuse-Argonne. Important Events in Organization: Charter applied for with sixteen members, committee appointed for county: Floyd Hausman, Alfred Neff, Earl Brown. 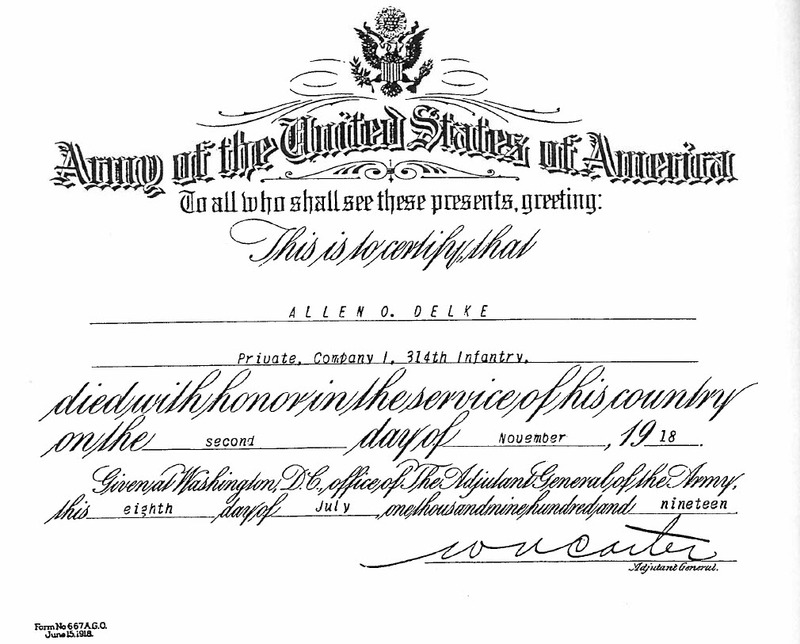 Additional Data Temporary charter, June 20, 1919, Permanent charter was issued August 1, 1920, named Allen O. Delke Post #16.
was given a week to settle his affairs and report for duty at 3 p.m. May 27 at Lehigh County Courthouse. finally brought the United States into the hostilities in 1917.
over the 19 months the United States was involved in the war. to the trenches of France and to places that are merely names in history for most. nine days before the Armistice was signed . and a little more than five months after his induction. when he came to Slatington. Members of the borough Ameri-can Legion Post that bears his name speculate the boy was probably looking for work. Although Delke had relatives in the area, Eva Schlosser Krum, one of the few people surviving today who knew Delke, said that relatives "didn't want him"
and so the boy took a room in the Schlosser home at 116 Main St.
but he always returned to the Schlossser home. and treated me and my brother Earl like a sister and brother. "I can still remember a time when he came home from a bridge project and brought a doll for me and a little girl who lived on the third floor. My mother told me not to go up those steps but I did and fell and broke the doll. "Allen just said he would buy me another when he found out. He was the best sort." The last letter Delke wrote to his cousins was dated Oct. 16, 1918. Creases in the paper make much of it unreadable and time has faded the sprawling pencil script. Two days before I left for the front I went over the top (a Legion member explained this meant Delke left the trenches to fight on the ground). I was there for several days and it was exciting at some times." The telegram, addressed to Lloyd Schlos-ser, arrived at the Main Street home on November 27, 1918. "Deeply regret to inform you that Private Allen O. Delke infantry is officially reported as killed in action Nov. Second." "My mother cried a lot. She wasn't the fainting type, but she just sat in a corner and brooded and cried," Mrs. Krum recalled. Allen O. Delke was not to return from Europe until three years after his death. it is believed that he was buried in Flanders Field during that time. 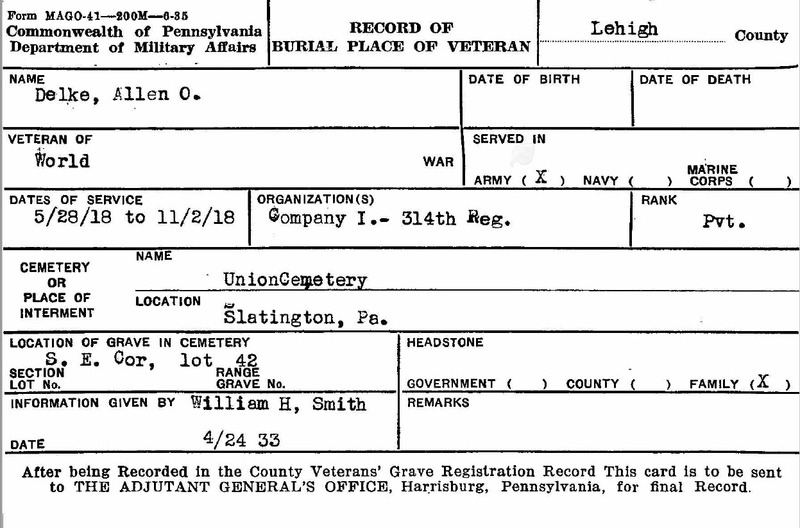 On Dec. 12, 1921, Delke was laid to final rest in Slatington's Union Cemetery, beside his mother and father. Slatington funeral director and post member George Harding. A Rev. Peters of the United Church of Christ conducted the service and the church choir sang. "Allen's relatives took up the first pew in the church," Mrs. Krum remembered. "The biggest light in my life came when the ushers put up chairs in front of the family for my mother and father and our family. They knew mother raised him when his family didn't want him." Delke's flag-draped casket was taken through the borough's Main Street on a horse-drawn caisson. Uniformed members of a National Guard unit or from the Ameri¬can Legion Post, it's not clear which, stood honor guard throughout. 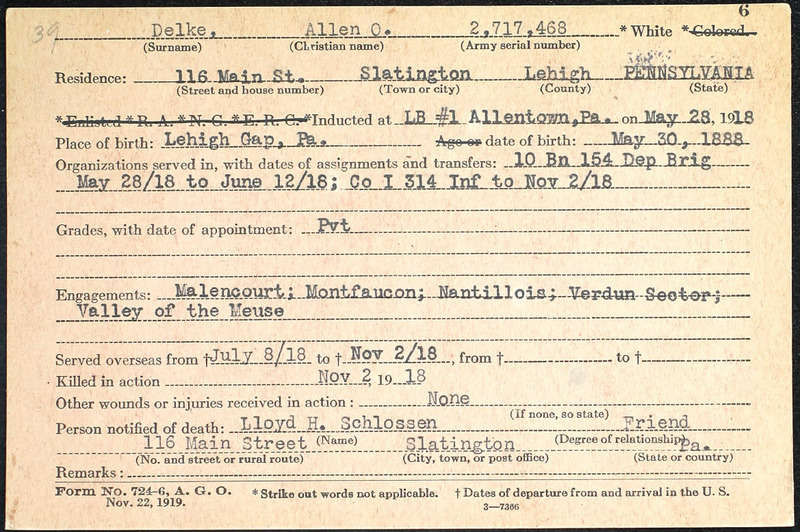 The Allen O. Delke Post was already in existence, named for the first man from Slatington to die in the war. As far as anyone can remember, a band and the choir accompanied the cortege to the cemetery gates and played and sang as the body was taken to the burial plot. Both Mrs. Krum and Legion members document the services as "one of the finest funerals in the Borough of Slatington." An old receipt found by Harding shows the entires cost was $109, paid for by Delke's cousins. 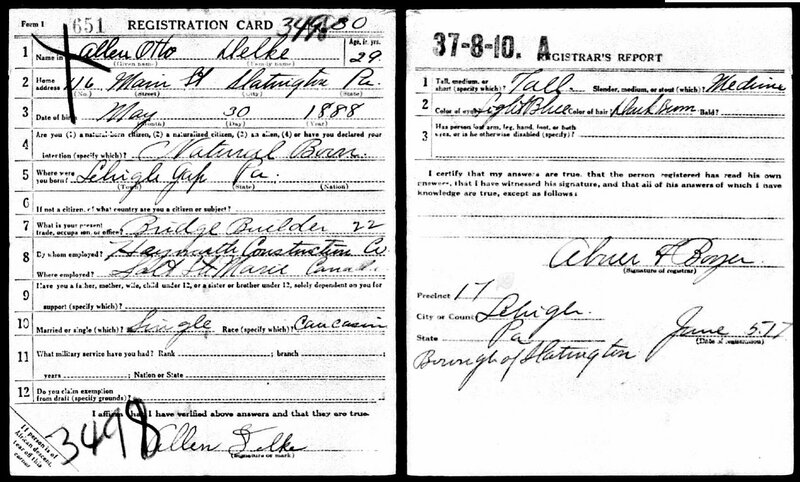 the telegram relating his death and a memorial death certificate certifying his honorable death. The certificate is signed by John J. Pershing, commander-in-chief of the Expedi-tionary Forces. Mrs. Hayes has donated the papers to the Allen O. Delke American Legion Post in Slatington. The Post, the oldest and largest in Lehigh County, continues today as an active service organization donating in the neighborhood of $10,000 a year to community activities. Cub Pack and Little League organizations, in addition to numerous other activities. The last military funeral in which the "CAISSON" was used in the year 1934. the Caisson was used to carry "Fred C. Wehr" (A World War I Veteran) to the Union Cemetery. During World War II the Caisson was melted down and used in the war effort. veterans, particularly those of the Korean and Vietnam wars, and the Gulf War which just ended in 1991. "We of the American Legion would like the general public to know that we, as survi¬vors of the previous wars, still fight for what they died for. in their names so they may never be forgotten." LEGIONNAIRE HARLAN REMALY, grave registrar at Union Cemetery, Slatington replaces flag on grave of World War I veteran, Allen O. Delke. The Slatington Ameri¬can Legion Post 16 was named for private Delke, who was the first casualty from that  area, during that war. Legionnaires holding flags for distribution are 1-r: Robert Harry Jr., vice commander; John Hedmeck, Vin¬cent Miller, Sgt.-at-Arms; Sherwood Yenser, and Mark Queen, adjutant. The members of the Allen O. Delke Amer-ican Legion Post 16, of Slatington, replaced over 130 dozen American flags on the graves of Veterans in 11 area cemeteries yesterday morning. New Tripoli, Heidelberg, Slatedale, and Williamstown cemeteries. beside the grave of his parents, William 0. and Sabilla Delke. 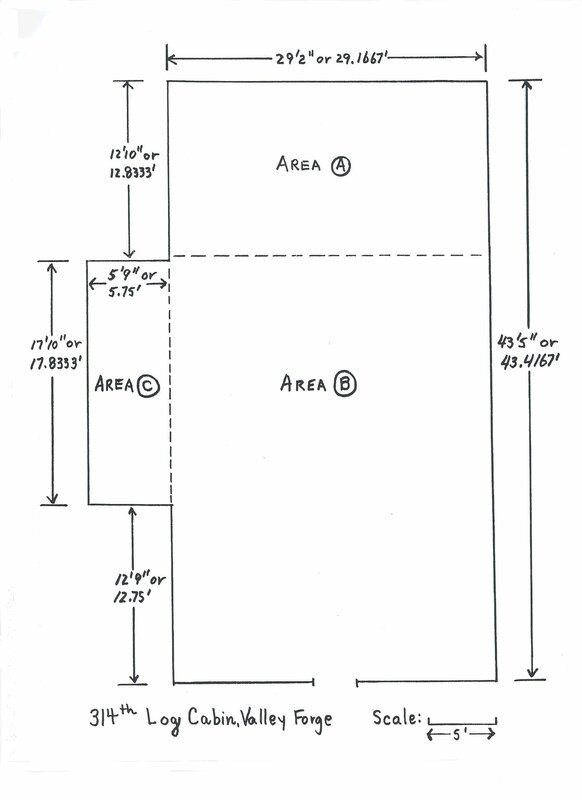 To be inclosed with each order into military service (Form 1028) sent to a selected man. which accompanies this notice for you to report to this Local Board for military duty is the time that marks your actual obligation as a soldier of the United States. Failure to report promptly at the hour and on the day named is a grave military offense for which you may be court-martialed. Willful failure to report with an intent to evade military service constitutes desertion from the Army of the United States, which, in time of war, is a capital offense. Upon reporting to your Local Board, you will not need, and you should not bring with you, anything except hand baggage. You will not be permitted to take trunks or boxes with you on the train. a comb, a brush, a toothbrush, soap, tooth powder, razor and shaving soap. It will add to your comfort to bring one woolen blanket, preferably of dark or neutral color. This blanket should be tightly rolled, the ends of the roll should be securely bound together and the loop of the blanket thus formed slung from your left shoulder to your right hip. You should wear rough strong clothing and a flannel shirt, preferably an olive-drab shirt of the kind issued to soldiers. such as a direction to request permission to eat and spend the last night at home, as it may desire to give. State of Pennsylvania COURT HOUSE, 5th & Hamilton Sts., Allentown, Pa.